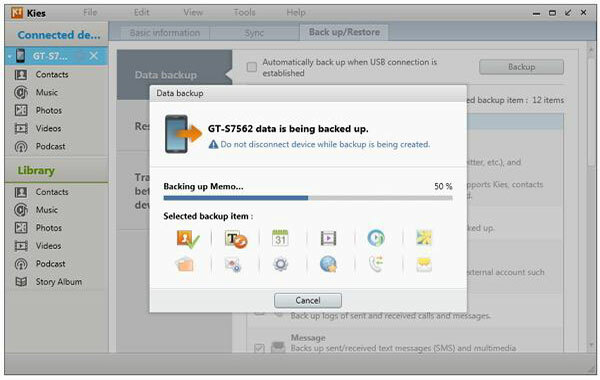 Having a data backup is very important for any mobile user. Samsung Galaxy S & Note series are among the most popular Android devices in the world. Here we present methods to back up data including photos, music, videos, contacts, etc. from Samsung Galaxy devices to Mac OS & Windows computers. 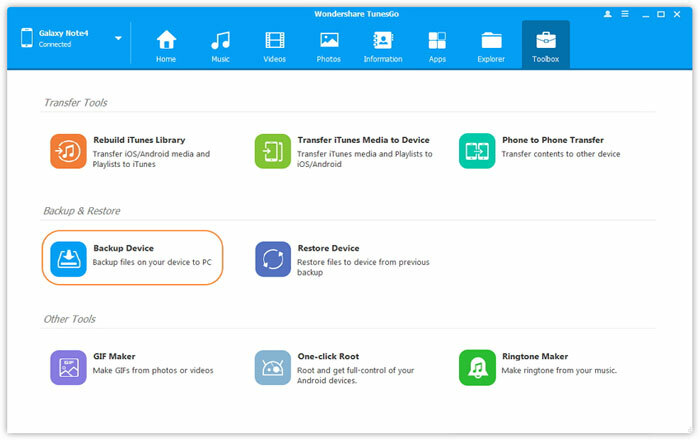 In the first part of this tutorial, we’re going to use the backup features of the TunesGo software, another useful application developed by Wondershare. 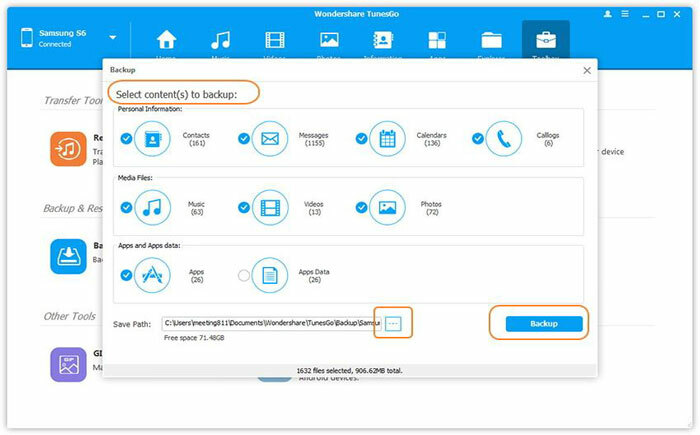 In addition to backup, other features of this program include making GIF (creating GIFs from videos and images), transferring data between phones (compatible with both iPhone and Android devices), import/export SMS & contacts, iTunes manager (sync iTunes and Android devices) and one-click root. 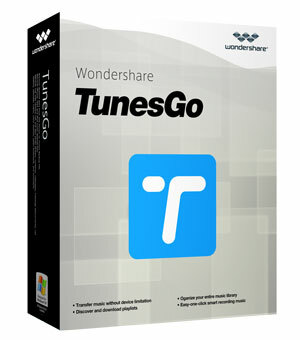 Wondershare TunesGo could be installed on Windows and Mac OS X systems. The program is compatible with more than 3,000 Android devices including Samsung Galaxy S series (like S7, S6, S5, S4, etc.) and Galaxy Note series (e.g. Note 7, 5, 4, 3 and Note Edge). Step 1. First of all, TunesGo application should be launched on Mac OS or Windows system. After that, use a USB cable to connect the Samsung Android device to the computer. Step 2. On the main window of the program, four options could be seen on the center. “Backup Photos to PC” is the ideal option for those looking to have a backup copy of the images and pictures of their Android smartphone on their computers. 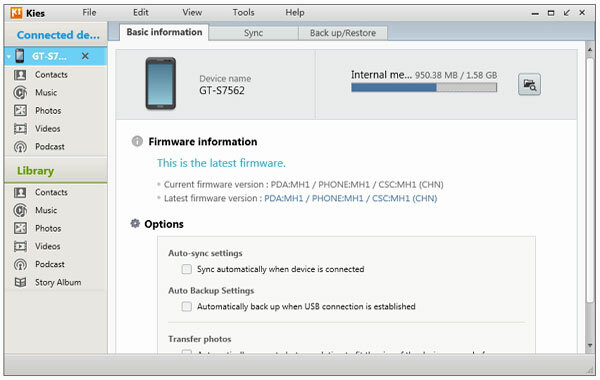 As many users might already know, Samsung Kies is a free application developed by Samsung for communication between Samsung tablets or phones and Mac or Windows computers with a USB cable. 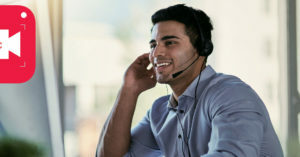 The program could be used for many reasons including device OS or firmware upgrades, extra device features purchase, limited multimedia management and data transfer, and data backup. 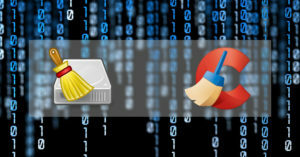 The first step is running the program from Mac or Windows computer. Of course, if not downloaded before, it should be downloaded from the official website and then be installed on the computer. After that, use a USB cable to connect Galaxy Note device or other Galaxy phones (such as S7, S6, etc.) to the computer. Three main tabs could be found on the top of the application. 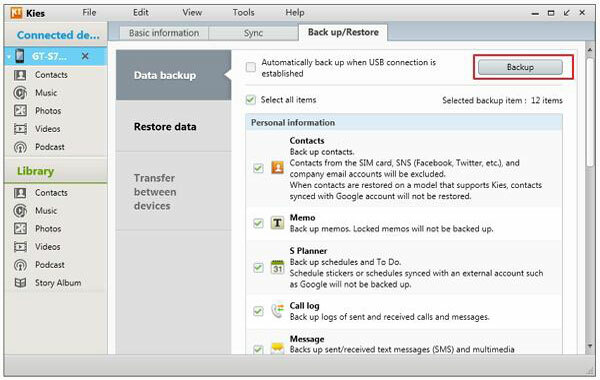 Select “Back up/Restore.” Next, in the related window below, check the boxes next to the items which should be backed up. These include messages, call logs, memos, contacts and more. Or if a user wants to backup everything, “Select all items” could be chosen simply to include all data in the backup. After every desired item is selected, the “Backup” button should be clicked. This is the final step in this backup process. All needed to be done is waiting until the process is finished. 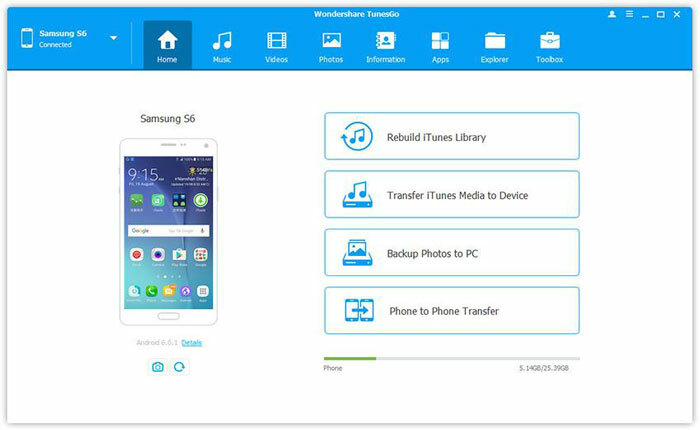 Needless to say, the following backup method works for all mentioned Galaxy phones and tablets including Note 2/3/4/5/7 and Galaxy S series including S7/S6/S5/S4/S3.